After sober reflections with respect to the reappearance of the greatest true son of the soil my hope got rekindled amid some skepticisms. 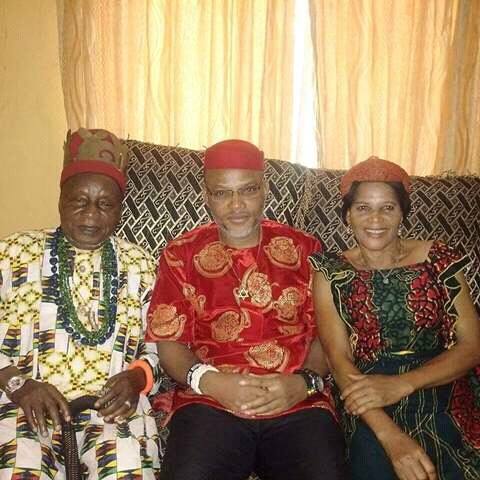 You can insult Him, you can argue with him, you can disagree with his methodology, hate, envy and jealous him at last Nnamdi Kanu is always right, he is with many steps ahead of his enemies. His strategies are divine, his approach is made from Apogee, his articulation is perfect to compare with the ordinary. He's truly made different. Lets for once be foolish and illiterates and live as a free people than claim wise and educated yet ruled, oppressed and captivated by illiterates. Tell me what our wisdom and exposure has gotten us, all these years if not an illiterate president like Mohammadu Buhari in the 21st century. In spite of our education and qualifications, Buhari is made a president, shame on you. Where were the facebook intellectuals when Nigeria was registered and recognized an Islamic country? What are they doing about the Arabic inscriptions on the naira notes and the Nigeria Army logo? I have never seen a secular country in the world where the other is more recognized than the other and decisions taken are made at the detriment of the other. Nnamdi Kanu was not born when the entire Biafra land was recognized as Jewish people in 1800 before the 1914 Amalgamation, it was Jewish articles and inscription the British found with our forbearers in Igbo land and other parts of Biafra Land that made them refer to us as Black Jews. Even the current Jewish state of Israel was not formed yet. One of the things the British saw or found with our forbearers was the Jewish star of David which signifies who we are. Nnamdi Kanu and IPOB are forever focused and determined to restore Biafra, we are taking every meaningful and best step and decision to secure a future for ourselves and children even the unborn, Almighty Ezechukwuokike determined that we come, we have no power of our own Chukwuokike leads while we follow. Nnamdi Kanu is the best gift, God Has given Biafrans, Nnamdi Kanu is the best thing that ever happened to us since 1914, Nnamdi Kanu is another savior sent by God Almighty Ezechukwuokike Abiama and we will forever remain grateful to HIM for sending us a savior. God is truly using the foolishness of this world to confound the wise.